Inspired by the shocking rise in heroin addiction among suburban teenagers, PERFECT HIGH stars Bella Thorne (The DUFF; Blended; Shake it Up!) as Amanda, a star high school dancer who starts using prescription painkillers after being sidelined by a knee injury. Feeling neglected and isolated, Amanda is adopted by an ultra cool group of friends, including Carson (Israel Broussard, The Bling Ring), Riley (Daniela Bobadilla, Anger Management) and Nate (Ross Butler, Teen Beach Movie 2). She quickly becomes part of their inner circle, which means sharing her pills, having regular “pharm” parties, and falling in love for the first time. At the same time, her new habits affect her dance team performance and raises concerns among her family, her best friend Alexis (Jasmine Sky Sarin, A Sister's Nightmare) and her teammate Brooke (Matreya Fedor, Cedar Cove). As their drug use inevitably spirals into addiction, Amanda and her friends resort to lying, stealing and worse to fund their habit. 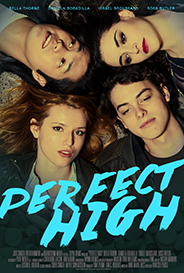 Their lives are forever altered when a classmate begins selling them heroin disguised as a cheaper painkiller from Mexico.